An abundance of our Epicurean products featuring smoked salmon from Straithard of Scotland, Prociutto di Parma, two peppercorn sausages rolled in Herbes de Provence, two types of pate, Brie cheese, French Dijon mustard, green olives, Cornichons, capers, mini toast, apples and pears. And for something sweet, our 64 piece Swiss chocolate truffles in a pine wood box. 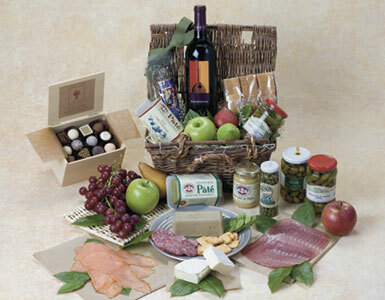 We specialize in meats, pate and cheese gifts, gourmet pate and sausage gifts, gourmet foods gift baskets, and make prompt delivery of your Epicurean picnic basket in Los Angeles, Beverly Hills, West Hollywood and Santa Monica.